AjaxTocco specializes in many heat treating applications including the following. 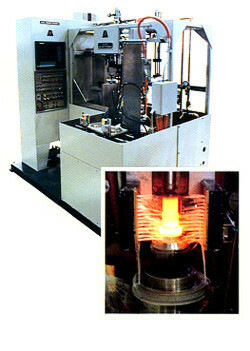 Integrated flexible heat treating, handling multiple parts. Here, spindles and hubs are hardened and quenched at the rate of 670 pieces per hour using programmable controls and robotics within a work-in-turn factory cell. This versatile system hardens and tempers C.V. Joint components for front wheel drive vehicles. 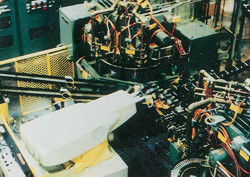 Ball tracks and stems of the tulip and bell utilize the same basic system, which features a two position shuttle for robotic interface loading. A one arm, pick & place load and unload device, plus a six position turntable features an orientation system to avoid part misalignment.